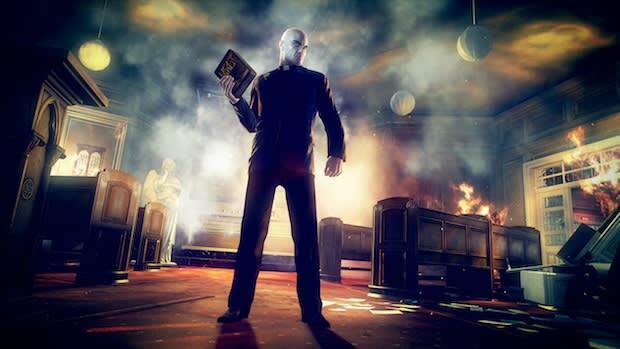 It's a bold enough change that Hitman: Absolution's premise is not based off a series of assignments (at least as far as Square Enix is willing to reveal). Instead, Agent 47 has a single target: Ms. Diana Burnwood. Sound familiar? That's because she was his handler in the previous games. Ever after viewing a trailer about the events that led to this mission, details are still scarce. I was assured by an IO Interactive spokesman that Agent 47's all-business nature shouldn't trigger any emotional second guessing even though this was his boss. This demo found Agent 47 at an orphanage, in a mission that appeared to be one of a multitude of indirect steps that would lead him to Diana. Thugs have raided the orphanage in search of a girl, which seems to be related to 47's interests as well. It doesn't take long to witness the kind of brutality the game is known for, where even the nuns aren't safe. At one point, 47 came across a guard who was about to be executed; it's one of many scenes that will test the player's determination in staying hidden. Thankfully there weren't any such scenes involving children.